Well, this is my first attempt in the blog world. I’ve been wanting to post for awhile but, decided I couldn’t have a blog with the name “Nitty Grits” without the first post being about grits. Come on! Not just grits. But, vegan grits. Tough task. I live in NYC and it is NOT easy to find grits in this town. After a search of about 3 specialty food stores, I found a box of instant Arrowhead Mills hidden on the bottom shelf of a Whole Foods. And it was the last box! I pitty the next person who goes looking for them. Obviously, instant grits are not ideal. I usually love Arrowhead Mills but I’ve never tasted any instant grits that are anywhere close to the real thing. 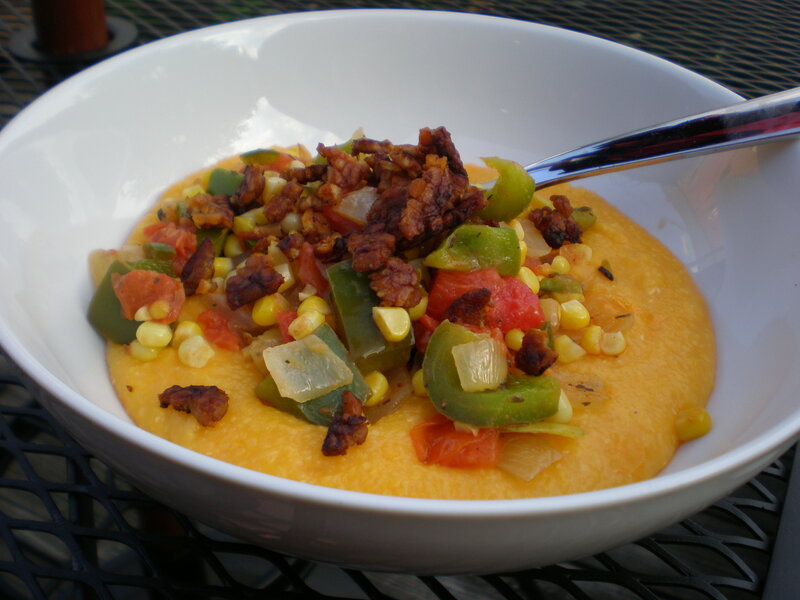 But, if you find yourself in the same predicament (are there many people looking to make vegan grits outside of the south – or anywhere? ), this recipe still turns out pretty fabulous. I love the crunch of the fresh corn mixed in there. Yum. Heat the 1 tablespoon Olive Oil on medium-high in a large skillet on medium high. Add the green pepper and cook until onion browns a little. Add the tomatoes and jalapeno. Reduce heat to low and cook for about 10 minutes. Stir often. While the onion mixture is cooking, bring water to a simmer and slowly add in the grits. Reduce heat to low and stir constantly so that the grits don’t get lumpy for about 5 minutes. Add the soy milk, cheese, Earth Balance, salt and pepper and stir until cheese has melted. While onion mixture and grits are cooking, heat 1/2 tablespoon olive oil in a small skillet and add crumbled tempeh. Cook until crispy then lay out on a paper towel to cool down. Divide grits into two large bowls, top with 1/2 each the onion mixture and 1/2 the crumbled tempeh. 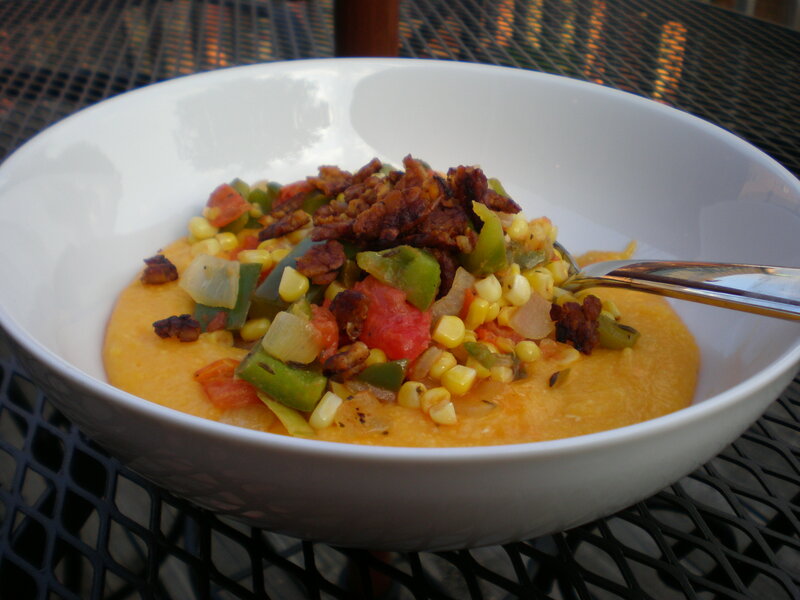 Posted on August 20, 2011 by nittygrits	• This entry was posted in Main Dish, Recipes, vegan and tagged dinner, entree, healthy, Serves 2, southern, tempeh, vegan, vegetarian. Bookmark the permalink. Wow! This sounds lovely I live in NYC too and I can never find the real thing so I guess I’m off to Whole Foods. Thank you. Good Blog I will check back with you. Thanks! It may just be better to order them online: http://www.ansonmills.com/products-page.htm Good luck! !